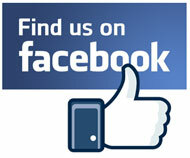 We have also recieved significant support from Conwy County Council but are unable to use their logo for legal reasons. 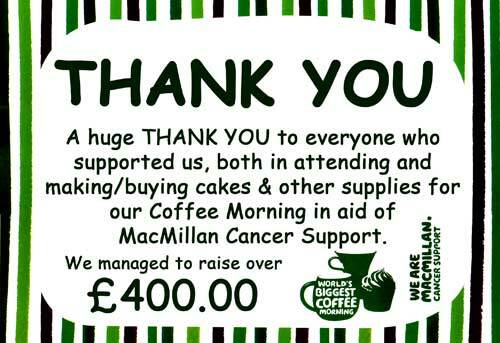 Well, what a fantastic result we had for MacMillan Cancer Support. We managed to raise £378.00 over the two days of our Coffee Morning. We also received a donation of some knitted teddys which were sold on eBay and have brought the total to over £400.00 so we are really pleased with that. 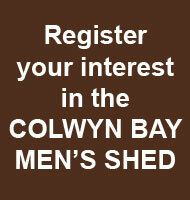 What is a Men's Shed? A Men's Shed is a community project with the aim of promoting men's health and well being through social interaction and practical activity particularly in retirement. This usually comprises of a communal workshop where the men can come together to work on individual or community projects, all within a safe and friendly environment. Each shed is different and will reflect the interests of those using it but the emphasis is on social contact with your peers coupled with practical activity of various kinds. 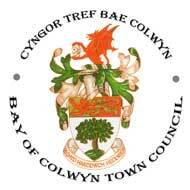 In Colwyn Bay, we have two meeting places. Friday mornings from 10:00am until 12:00 noon we meet at Pentre Newydd Community Centre in Old Colwyn with other times during the week at our own workshop & recreation area on Rhiw Road in central Colwyn Bay. Directions to both venues can be found here. It is well known that men often suffer from shorter and less meaningful lives after retirement partly due to the lack of social connections. A Community Workshop or 'Men's Shed' as these venues have come to be known, can help to improve life by providing a place where the man can go to interact with his peers and once more participate in useful activity. There's an interesting short film on the BBC website about the guys in the Camden Town Shed and if you do a YouTube search you will find plenty more videos. 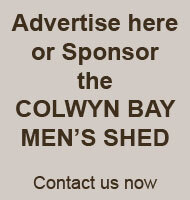 There are currently hundreds of Men's Sheds in the UK either already established or in the planning stages but relatively few in North Wales. Other local sheds include Abergele, Rhyl, Llandudno, Denbigh, Prestatyn, Llandulas, & Llanrwst, with a number of others in the planning stage. Who is the Shed aimed at? What goes on at our meetings? The main focus of activity is whatever the 'shedders' or members want to do. This may sound like an overly simple statement but if you study the activities of Men's Shed elsewhere you will see that the range of activities is very wide. Our Friday meetings are a relaxed event where the men have an opportunity to socialise and chat. With plenty of banter and the chance to solve all the worlds problems over a cuppa, there is a wonderful atmosphere within the group. Often we will arrange a speaker for these meetings which gives a further topic for discussion. It cannot be under-estimated the value such gatherings have for the guys and if you want to experience it, just turn up and feel the electricity. There's no obligation to do anything other than what you want to do. Our Premises on Rhiw Road have a variety of meetings throughout the week with the main focus being on woodworking activities, but other things happen there as well. For example, Monday afternoons is taken up with ukulele & singing practice with our award winning band. Pop-in and have a sing along, you won't regret it. Our social gathering on Friday mornings is completely free although we ask members for a voluntary donation of £1.50 and usually have a raffle with tickets at just £1.00. The workshop facility on Rhiw Road has more significant costs and there is a small charge of £2.50 for attending. This covers a full week's meetings no matter how many you attend. Note: The workshop charge is mandatory for all attendees. If you are interested, either as a potential member of the shed or other interested party, please register your interest to be kept up to date with our activities.